What's included in a rental? NOTE: All other equipment and personnel needs will incur additional charges. See the Ancillary Equipment rate sheet for current prices. Includes: Two technicians, house manager (90 minutes prior to the start of performance), use of backstage areas, standard house lighting, standard house sound and infrastructure fee. Includes: Use of backstage areas. Rehearsal rates are not applicable Friday, Saturday or Sunday, unless performing on the same date. There must be a full two-hour break between rehearsal and performance pricing. Rehearsal rental rate does not include technical support. Multi-User: Nonprofit groups scheduling two or more separate events per fiscal year (July – June) in the Concert Hall. All events must be booked at the same time for the discount to apply. Equipment and Services: Any costs incurred for special set-ups or additional equipment (including the use of technicians and/or laborers), will be charged to the group named in the contract. Groups selling tickets in the Center and/or anticipating attendance of more than 200 people will be charged for the services of a NOVA police officer for a minimum four-hour shift. Technical Staff: You are required to use Center technical staff, except in extremely unusual circumstances. Center management must authorize the use of any non-Center staff and a list of said staff, with appropriate credentials, must be submitted at least 72 hours prior to the group’s first use of the building. Center management retains the right to make final decisions on all staffing issues. Infrastructure Support: A fee that supports the building maintenance, administrative services and college services. Sonic Ear Assisted Listening System available. Accessible in compliance with ADA. Total legal stage capacity is 134. NOTE: Stage Capacity is reduced by 33 each time a rear acoustic wall moves forward by the width of one side panel (fully open - 134; reduced by ¼ - 101; reduced by ½ - 67; reduced by ¾ - 34). Total legal stage capacity is 172 with the wall at the back of the stage. Proscenium Width Fully Open - 57' 10"
Upstage Width Fully Open - 53' 4"
Movable Orchestra Pit Platform adds extra 10’ of depth. Wing Space SR-14'; SL-10' 6"
US Cross-Over Height - 24' 6"
Access From Dressing Rooms: USL and USR; loading door from dock SR wall; apron doors to the house from backstage stage right and stage left. Rosin-Free Marley-Like (Rosco) dance floor available. It has both a grey side and a black side, either of which can be used for dancing. No traps or elevators in the floor. Orchestra pit is 58' wide x 27' deep at the center. The DS 10’ of the orchestra pit is a height-adjustable platform with stops at stage level, seating level and pit level. Entrance to the pit is from the SR end. The orchestra pit comfortably seats 60 musicians. Single purchase counterweight system with 42 line sets. Locking rail is SL at stage level. Loading bridge is at grid level. The main curtain is light gray velour. NOTE: Only the main curtain is permanent. All other soft goods must be hung as needed. Control board located in booth at the back of the house with DMX and ethernet connections located in the house floor control position and at the Stage Manager's panel SR.
(3) High-End Systems Cyberlight 2.0 -- NOTE: Technical programming charges may apply. All instruments and outlets are 2P&G stage connectors. All ellipsoidals have pattern slots. There are barn doors for all fresnels. All Colortrans have top hats. Follow Spot 2 Lycian Super Arc 400 model 1267 in booth above balcony, approximately 75' from proscenium. We have access to a Barco ID Pro R600 DLP projector. Other equipment may be rented from local AV companies. The hall is a 981-seat proscenium theater with near-perfect acoustics designed by Artec, Inc. Sound reinforcement is unnecessary for most purposes. Microphone and line-level input jacks are distributed throughout the theater and lower lobby. The main control booth located at the back of the house. The house floor control position located on the orchestra level just in front of the balcony overhang. The Stage Manager's panel SR (limited capacity). The Schlesinger Center can make audio recordings of your event. Audio recordings will be stereo recordings onto CD. See our rate sheet for current prices. Easy truck access is available at the loading dock SR. The dock features swing-arm loading light and roll-up door. Load-in is at stage level. Access for 48' semi-trailer trucks is available and cast/crew bus parking. Road boxes may be stored in loading zone. Star dressing room is located just off stage right (suitable for up to five people). Two chorus dressing rooms are located backstage (suitable for up to 25 people each). Green Room is located off SR. Chorus dressing rooms are equipped with sinks, showers, mirrors, dressing tables, chairs, toilets and costume/wardrobe racks. The Rachel M. Schlesinger Concert Hall and Arts Center is a non-union house with an experienced staff. Local crew can be assembled. 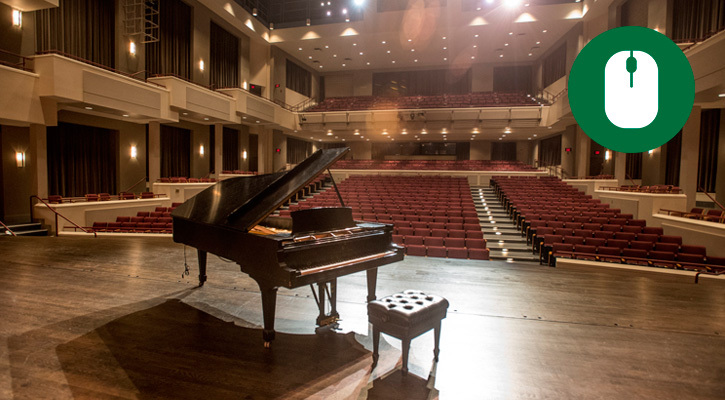 The Rachel M. Schlesinger Concert Hall and Arts Center includes a breathtaking 981-seat theater, beautiful glass-enclosed Wachovia Forum, the intimate Margaret W. and Joseph L. Fisher Art Gallery and Internet-ready seminar rooms. The variety of spaces can be configured to host any event, from board meetings, product launches and keynote speeches to corporate dinners, wedding receptions and fundraising galas. Spacious, tastefully appointed lobby areas on the first and second floors of the Center provide the perfect spot for pre-function receptions, meeting breaks, dessert buffets and much more. The Schlesinger Center has five-foot rounds that will seat eight people, with oversize banquet chairs, 6’ x 36” and 6’ x 18” rectangular tables all included in the rental fees. Entry Foyer and Side Lobby may be used for pre-function space only. *A warming kitchen is located adjacent to the Wachovia Forum and contains an industrial-sized refrigerator and microwave. 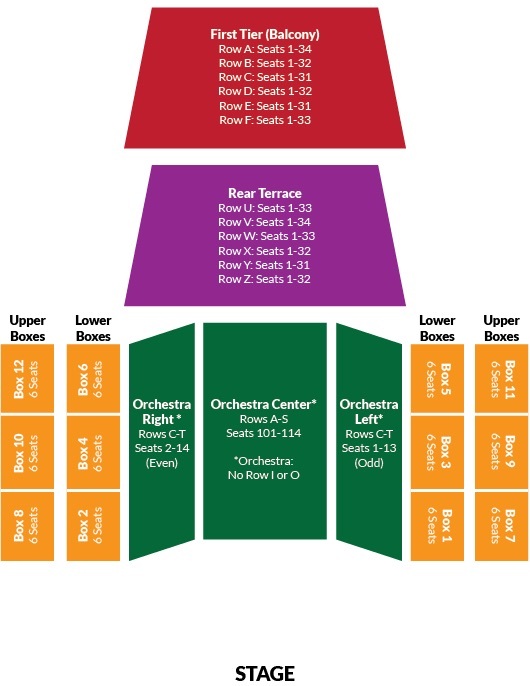 **The Schlesinger Center Concert Hall has fully-equipped lighting and sound systems.